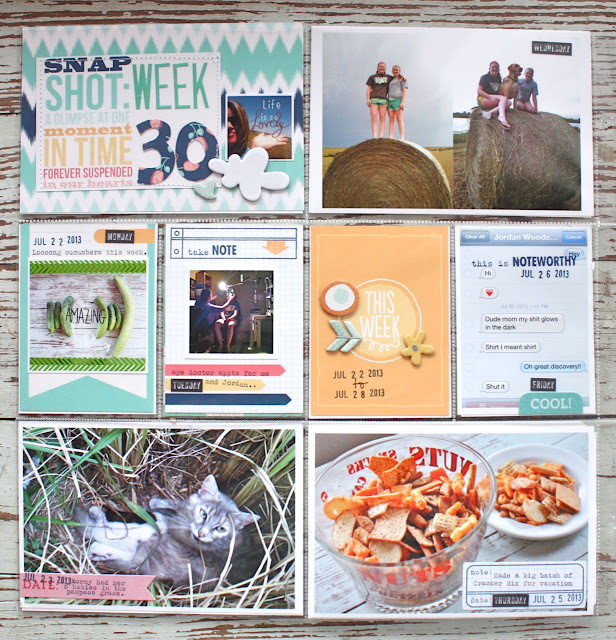 I'm moving right along in sharing my Project Life weeks and for week's spread I used items from the September Gossamer Blue Life Pages Kit only. 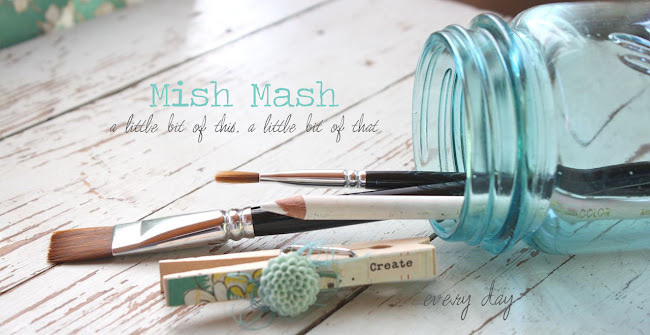 There are still kits left in the Gossamer Blue store so there's still time to pick up a kit whether you are a subscriber or not. 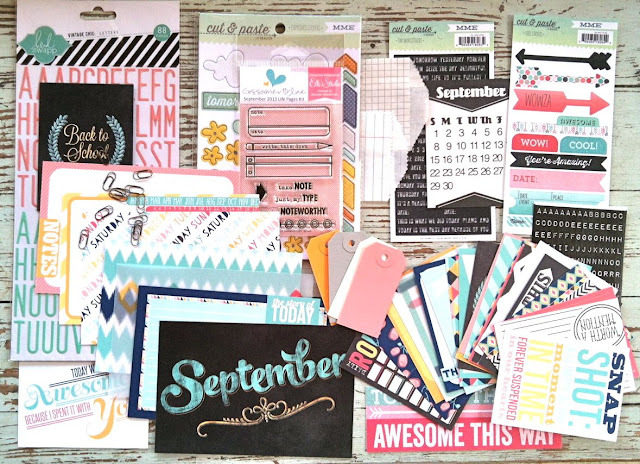 Take a look at the kit contents below....it's jam packed full of journaling cards, embellishments, alphabets, stickers tags, tiny paper clips and many exclusives like our own Traci Reed designs + the exclusive Elle's Studio stamp set (with concepts by me). :) All of the cards are double sided for vertical or horizontal orientation. Let's get right to my Week 30 pages. This is my weekly planner sketch which includes no inserts for this week. I have a few ticket stubs saved but those will easily fit into my 2 page layout. 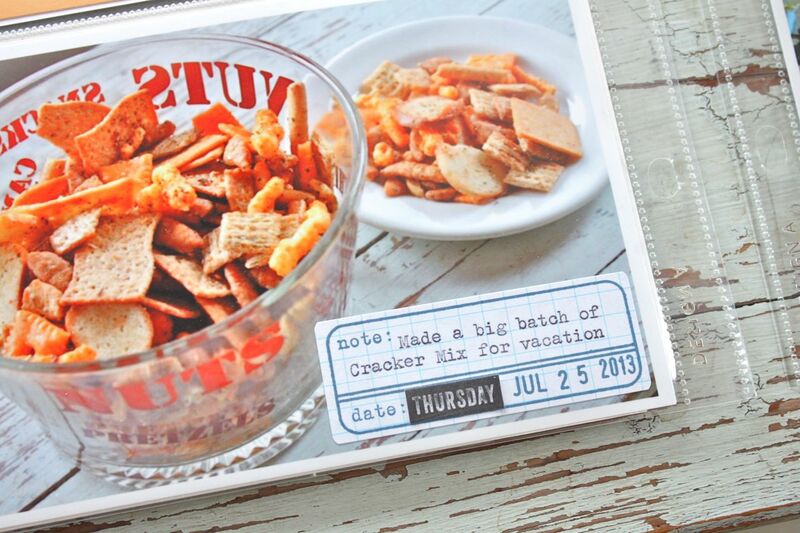 This is a good time to address the issue of subscribing to just the Life Pages Kit. Is it enough? Do you need other kits? 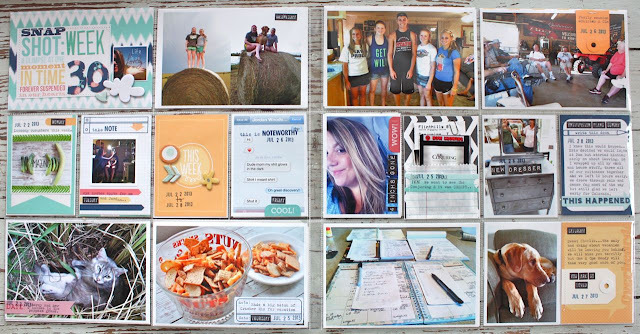 After completing about 4-5 weekly Project Life spreads which included inserts, I would say that you would probably have enough journaling cards to cover most of those weeks...that is if you add in lots of photos like I do. There are 25 (3 x 4) cards and 7 (4 x 6) cards included in this month's Life Pages Kit. You'll see with my future Project Life weeks how I added to this kit with other GB kits. 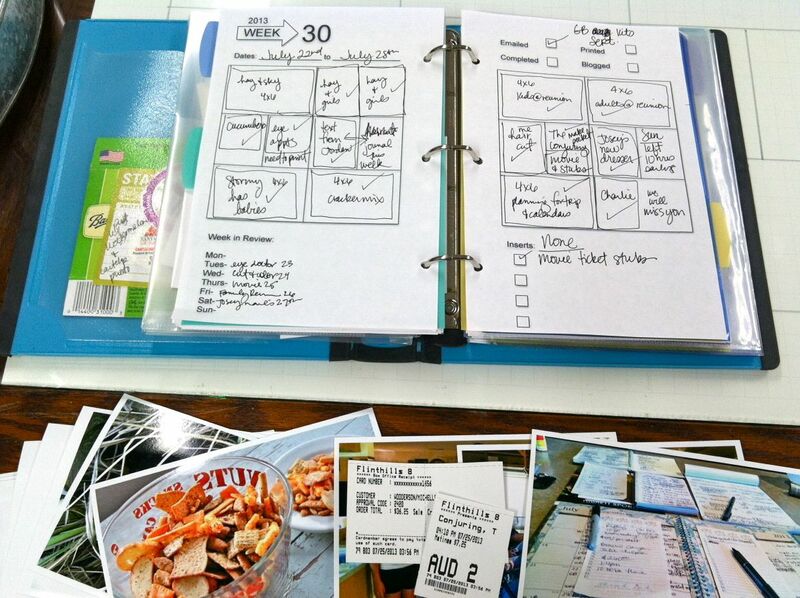 So my answer.....if you only want to get the Life Pages Kit, it will mostly likely get you through the entire month. Here's my 2 page spread, I kept it pretty simple this month as we were about to head out for a week long vacation. Here is the left page of my Week 30. I used a photo in all but one slot. This is the right page of my Week 30. Here I used photos in every slot. This is my main, dated 4 x 6 insert. I used an exclusive GB Life Pages 3 x 4 card in the horizontal format for the top layer along with some stickers, hand cut letters and chipboard accents. I was particularly excited about this label stamp from the Life Pages kit this month. I requested that it be designed to fit onto an address label stamp and Elle did a fantastic job of making it fit perfectly. The stamp easily works with my Grid Paper Labels and Notebook Paper Labels in the my shop too. 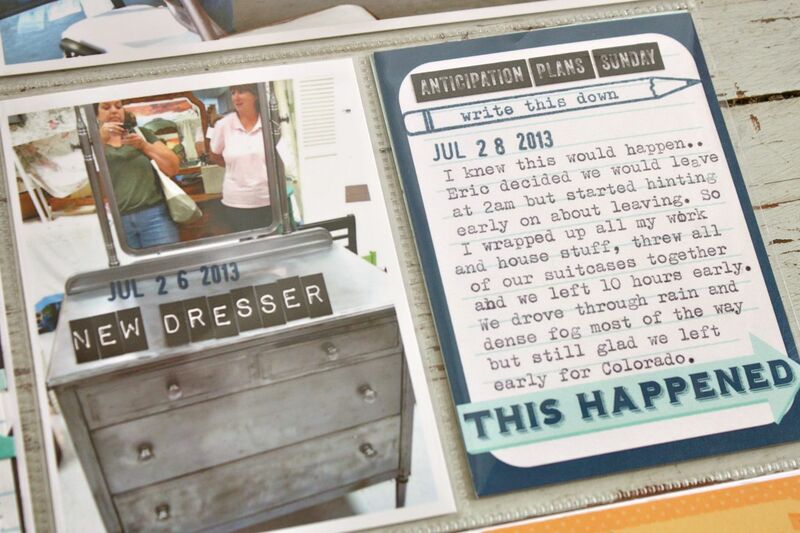 I found that you can run a sheet of my paper labels through a typewriter and get 2-3 lines of typed journaling. You can see that I used 2 lines below. There is just the right amount of space for an office type date stamp too. 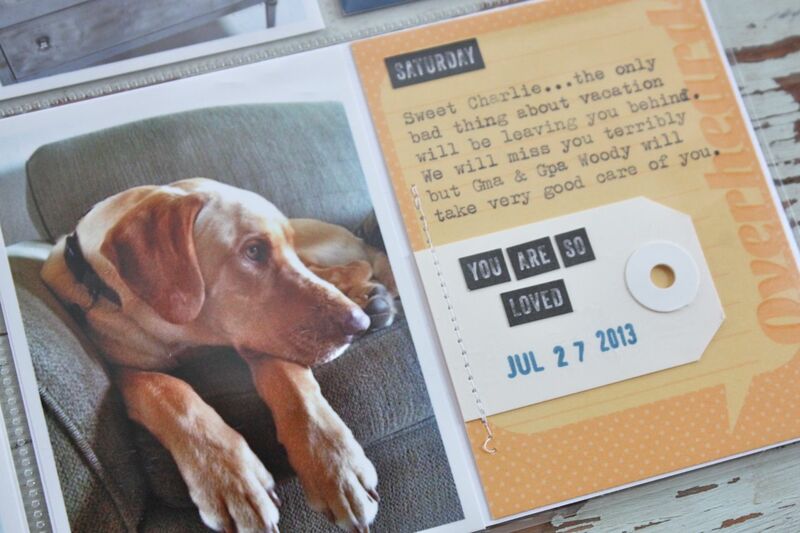 Here I used a Life Pages 3 x 4 card and a manila tag, both from the Life Pages Kit. The word stickers are also from the kit. A little bit of stitching finishes off the tag. 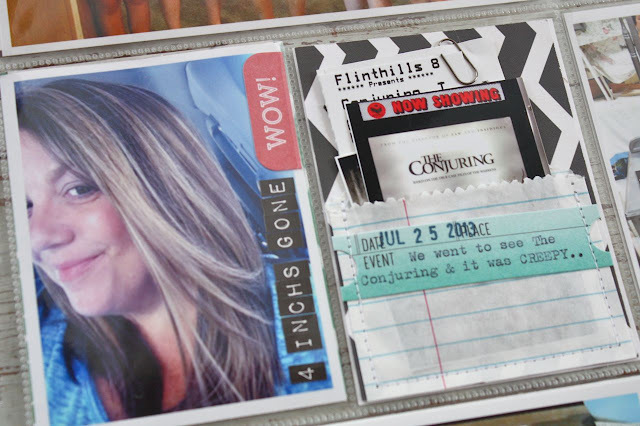 This journaling card is placed adjacent to a 3 x 4 photo and fits into a 4 x 6 slot. You can totally use the 3 x 4 cards in a 4 x 6 slot. 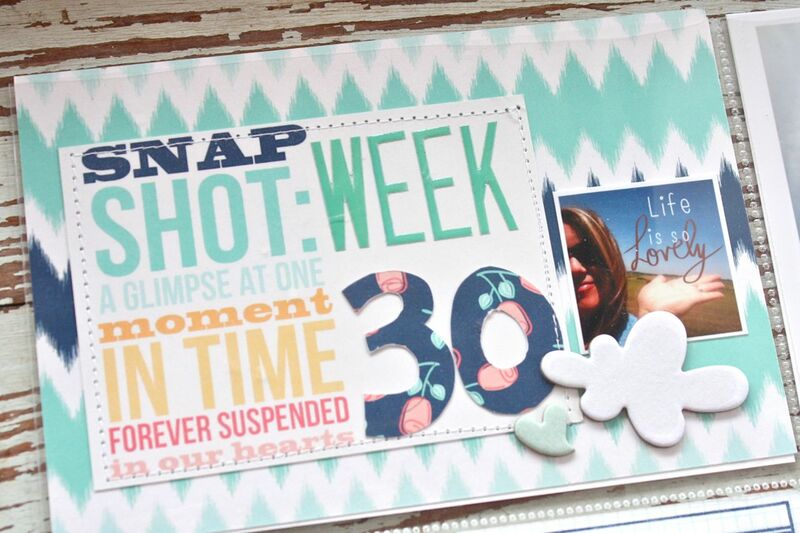 I typically will adhere both the photo and the card to a thin piece of white cardstock. 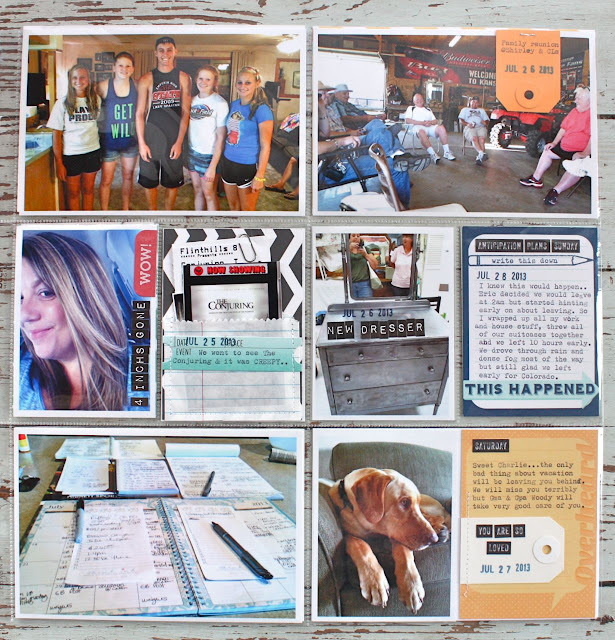 Some more 3 x 4 inserts with mini Instagram photos. On the left, I used the A Beautiful Mess app for the chevron pattern and word on the photo. On the right you can see more stamps from the Life Pages stamp set. I just love the colors in this month's Life Pages Kit. If you do decide to purchase other kits, Traci and Lori did a fantastic job in coordinating the colors to match up with the other kit items. That's what I love about using more than one on my Life Pages...it all coordinates but I am still able to achieve that mixy matchy look I love so much. 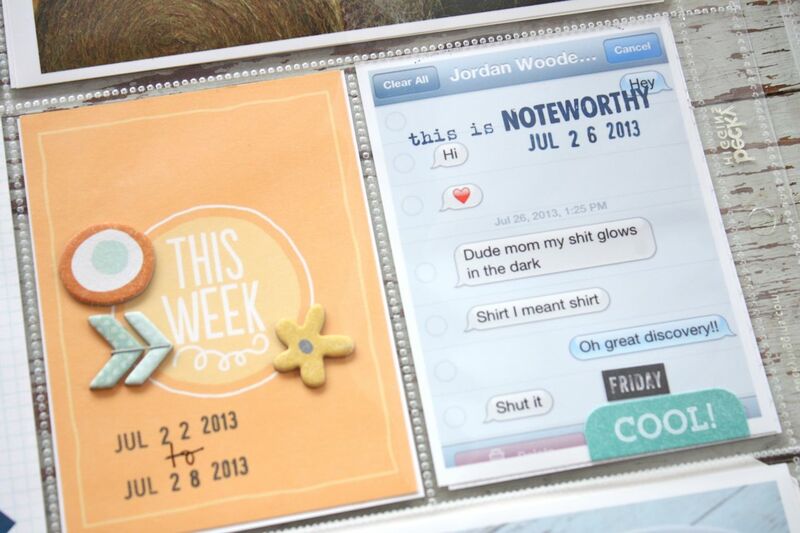 Please note the right card....Jordan made a boo-boo in her text message to me and I laughed for a week straight!! On the left, I got a hair cut. It's rare to see my hair that straight so I have to snap photos. I rarely straighten it like that ever because my hair is too curly. On the right I had a little fun with a mini sack from the Life Pages Kit. I trimmed the sack down and stitched it onto a journaling card. Inside I tucked in movie ticket stubs and a small photo of the movie we saw. I used a tiny paper clip to hold the items together. Thank you Lori for including those paper clips for me this month, I love them! Note: The Conjuring was quite scary....based on true events so it was bone chilling. On the right, below, I snapped a photo of Josey's new dresser. We found this 1920's stainless steel beauty at a vintage sale and got a really good deal on it. Now I need to find some other stainless steel accents for her room. On the right, I stamped a journaling card noting how we left for our Colorado trip 10 hours early. It was a great lead in to Week 31 which captures our vacation. If you're so inclined, Ali Edwards' Week In The Life 2013 is happening this week. You can read all about it here. 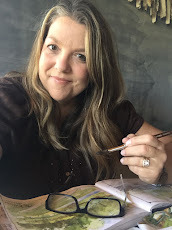 I opted not to join in this week as I feel I capture my weeks pretty well with my Project Life + I want to catch up on my vacation photos and get my craft room all tidied up for the upcoming Gossamer Blue Daily December kit coming soon. I love to follow along with everyone's projects though so I'll be watching closely. I've also been doing some extensive menu planning this week. Now that the girls are back in school it makes our schedule a little more crazy. There are late practices, lots of homework, volleyball games, school board meetings and it all just makes meal times tricky at times. I've worked out a pretty good plan for all of September and October since our weekly schedule is basically the same every week. I'll be sharing my new plan soon. Also, new kits and other items have been trickling into my online shop. Thank you so much to those of you who have placed orders. Thanks for stopping by. See ya soon. I love your style with PL!! It's so effective and really captures the essence of what's happening right now. Especially love the little pocket to hold the movie tickets - so great. PS - I'm yet to start using my kit, and after seeing this, I feel very inspired. I'm very interested in your meal planning and suggestions! Michelle- is there any chance you would be willing to share a PDF of your Project Life planning pages? I have a small three-ring binder that holds 5.5" wide by 8.5" high pages.